Members: Local 926 is now accepting dues via PayPal. You can pay with your PayPal account, or a debit or credit card. If you would like to pay your dues please use the button below. If your not sure of how much your dues are, please call the office to confirm. Dues are currently $165.00 a quarter + a $5.00 credit card/ PayPal processing fee. If you are paying through PayPal please be sure to pay $170.00 per quarter. Please note: PAYMENTS MADE THROUGH PAYPAL ARE NOT PROCESSED TILL THE NEXT BUSINESS DAY! WE ARE UNABLE TO ACCEPT YOUR DUES IF YOU ARE SUSPENDED WORK WITH THE DISTRICT COUNCIL, OR IF YOU ARE SUSPENDED WITH THE LOCAL. IF YOU MAKE A PAYMENT AND YOU ARE SUSPENDED, YOUR PAYMENT WILL BE REFUNDED TO YOU! As of July 1st 2017 new monthly dues are $165.00 per quarter. If you are paying with a debit/credit card/PayPal there is also a $5.00 fee. Scholarship Winners 2019 – Isabella Mangiafridda, Talya Morea & Christopher Tagliaferro – Congratulations! Local 926 is looking for JOURNEYMEN IN GOODSTANDING to represent Local 926 at the upcoming 300 Hitters Club in LAS VEGAS! You may also contact Salvatore Tagliaferro via email stagliaferro@nycdistrictcouncil.org with your name, UBC and your telephone number if you are willing to attend. Thank you! PLEASE NOTE THAT FULL ACTIVE MEANS PAYING FULL DUES – this is not applicable to retired, early retired, disabled or City Workers. Local 926 now has embroidered patches available for purchase. Patches can be purchased at the Local Office, and some will be available for Purchase at the monthly meeting. These patches can be ironed on or sewed on. We have patches for $4.00 a piece, they are approximately 4 inches in size. Local 926 is committed to growth…we are looking for members to join our new committees. We are starting 3 committees. Political Action & Organizing, Apprenticeship Committee and Retiree Committee. If you are interested in volunteering your time to any of these committees please call the office and add your name to our list and our organizers will get in touch with you! Remember its your commitment that can bring about change! WE NEED YOUR EMAIL ADDRESS! It’s so important to be well informed…please call the office and add your email address to our notification list. You will receive important notifications such as events, meetings, elections and any other pertinent information! 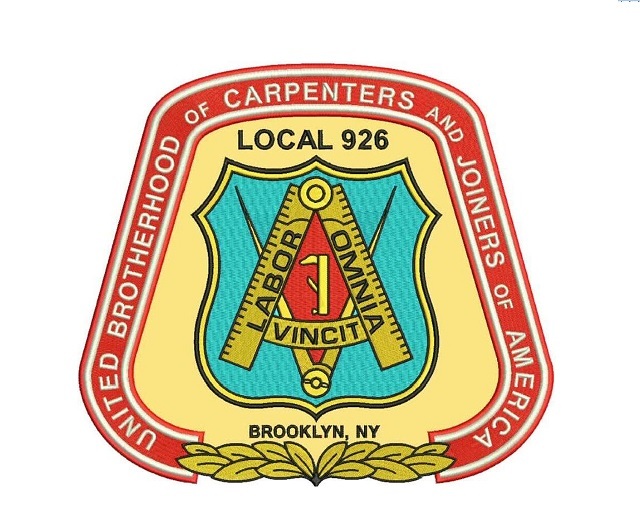 You can also email us your information at info@local926.org Please remember to include your name and UBC. Our meeting is held on the 3rd Tuesday of every month @ 5:30 pm. Next meeting Tuesday, May 21, 2019. Accessible via the R train. We will be selling 50/50 tickets at the meeting. All proceeds will benefit Local 926’s Maria Concillo Scholarship Fund. Local 926 offers Automatic payments for your Quartely Dues. You can set up a Debit or Credit card to pay your dues automatically.